Though small in area, the continental margins are the focal point of land, sea, and atmosphere interactions. They have special significance, not only for biogeochemical cycling and processes, but also increasingly for human habitation. In comparison with the relatively uniform environment of the open oceans, or the rapidly mixing atmosphere, the spatial and temporal heterogeneity of the world's coastal zone is considerable. In addition, human impacts on these relatively small areas are disproportionately large (Pacyna et al. 2000). Several recent studies show that the continental margins currently function as substantial carbon sinks. Ver et al. (1999a, b) and Mackenzie et al. (2000) estimated a source of 0.2 PgC y-1 in the preindustrial era. They argue that the flux has decreased since 1800, a consequence of an ever-increasing nutrient discharge. Recently Mackenzie and coworkers (Rabouille et al. 2001) concluded that the continental margins were net sinks of 0.24 PgC y-1 in the preanthropogenic state (Figure 18.2). Assuming that the estimates of Ver et al. (1999a, b) and Mackenzie et al. (2000) were consistently low by 0.44 PgC y-1, the continental margins in 2000 would have been sinks of 0.34 PgC y-1. Though this adjustment may be an oversimplification, it reconciles the air-sea flux ofVer et al. (1999a, b) and Mackenzie et al. (2000) (Figure 18.3) with my result of 0.36 PgC y-1 (Figure 18.1). This is a significant fraction (16 percent) of the "global" air-to-sea flux of 2.2 PgC y-1 (Takahashi et al. 2002). Figure 18.3. Organic carbon balance (dashed line) and net exchange flux of CO2 across the air-seawater interface (solid line) for the coastal margin system, in units of 1012 moles C y-1 and Pg y-1. Positive values indicate the CO2 flux is directed toward the surface waters (modified from Ver et al. 1999a by adding 36.7 X 1012 mol y-1 or 0.44 Pg y-1 to their results). flow will reduce the cross-shelf water exchange through a reduced buoyancy effect, and it will also diminish the onshore nutrient supply. Decreased primary production and fish catch on the shelf typically follow dam construction. Globally, approximately 40 percent of the freshwater and particulate matter entering the oceans is transported by the 10 largest rivers. Buoyant plumes move much of the water and nutrients to the open shelves. Hence, these shelves also experience a diminished biological pump and fish production when damming reduces freshwater outflow. The fraction of riverine particulate carbon that is deposited in the deltas or beaches or converted to the ever-increasing DOC pool is not well known. On the other hand, the coastal oceans may be heterotrophic but nevertheless absorb CO2. The first LOICZ report (Kempe 1995) concluded that coastal seas could be net sinks or sources of CO2 for the atmosphere, with slim prospects for a quick resolution. 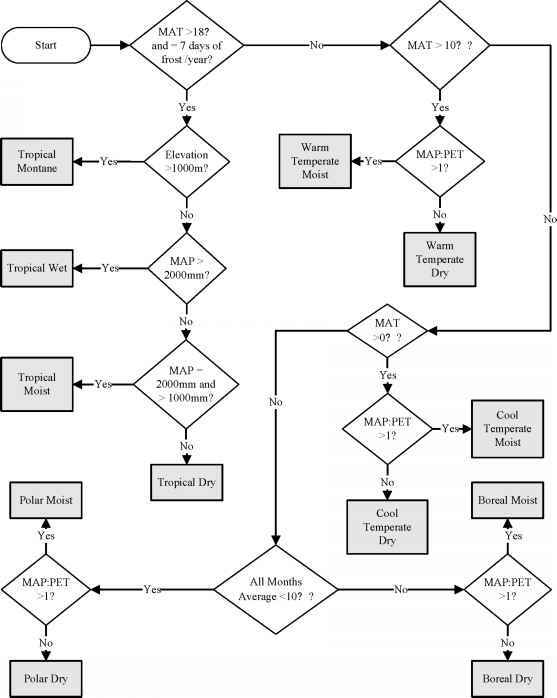 Now, mass balance calculations, as well as direct pCO2 measurements, indicate a consistent pattern. Taken together, continental shelves are significant sinks for atmospheric CO2, absorbing 0.36 PgC a year. This flux is a composite over many estuaries, coastal waters, and intensive upwelling areas, which are typically supersaturated with respect to CO2, and most open shelf areas, which are probably undersaturated. This "continental shelf pump" is primarily fueled by the cross-shelf transport of nutrients from nutrient-rich subsurface waters offshore. Though they are sinks for CO2, the shelves release 0.1 X 1012 mol y-1 CH4 and 0.07 X 1012 mol y-1 DMS into the atmosphere. New production supported by the external sources of nutrients represents about 13 percent of primary production. The other 87 percent is respired and recycled on the shelf. Some of the organic material that is not recycled accumulates in the sediments, but most of the detrital organic matter, mainly in its dissolved form, is exported to the slopes and open oceans. I am indebted to the National Science Council of the Republic of China, which provided partial financial assistance (NSC 92-2611-M-110-003). N. Gruber made detailed and constructive criticisms, which strengthened the manuscript. Abril, G., M. Nogueira, H. Etcheber, G. Cabecadas, E. Lemaire, and M. J. Brogueira. 2002. Behaviour of organic carbon in nine contrasting European Estuaries. Estuarine, Coastal and Shelf Science 54:241—262. Alvarez-Salgado, X. A., D. M. Doval, A. V. Borges, I. Joint, M. Frankignoulle, E. M. S. Woodward, and F. G. Figueiras. 2001. Off-shelf fluxes of labile materials by an upwelling filament in the NW Iberian Upwelling System. Progress in Oceanography 51:321-337. Bauer, J. E., E. R. M. Druffel, D. M. Wolgast, and S. Griffin. 2001. Sources and cycling of dissolved and particulate organic radiocarbon in the northwest Atlantic continental margin. GlobalBiogeochemical Cycles 15:615-636. Chavez, F. 1!, and J. R. Toggweiler. 1995. Physical estimates of global new production: The upwelling contribution. Pp. 313-336 in Upwelling in the ocean: modern processes and ancient records, edited by C. P. Summerhayes, K.-C. Emeis, M.V Angel, R. L. Smith, and B. Zeitzschel. Chichester, UK: John Wiley and Sons. Chen, C. T. A. 2000. The Three Gorges Dam: Reducing the upwelling and thus productivity of the East China Sea. Geophysical Research Letters 27:381-383. -. 2002. Shelf vs. dissolution generated alkalinity above the chemical lysocline in the North Pacific. Deep-Sea Research II49:5365-5375. Chen, C. T. A. 2003b. Air-sea exchanges of carbon and nitrogen in the marginal sea. In Carbon and nutrient fluxes, I. Global continental margins, edited by L. Atkinson, K. K. Liu, R. Quinones, and L. Talaue-McManus. New York: Springer-Verlag (submitted). Chen, C. T. A., and S. L. Wang. 1999. Carbon, alkalinity and nutrient budget on the East China Sea continental shelf. Journal of Geophysical Research 104:20675—20686. Chen, C. T. A., K. K. Liu, and R. MacDonald. 2003. Continental margin exchanges. Pp. 53—97 in Ocean biogeochemistry: A JGOFS synthesis, edited by M. J. R. Fasham. Berlin: Springer. de Haas, H., T. C. E. van Weering, and H. de Stigter. 2002. Organic carbon in shelf seas: Sinks or sources, processes and products. Continental Shelf Research 22:691—717. Epping, E., C. van der Zee, K. Soetaert, and W. Helder. 2002. On the oxidation and burial of organic carbon in sediments of the Iberian margin and Nazaré Canyon (NE Atlantic). Progress in Oceanography 52:399—431. Fasham, M. J. R., B. M. Baliño, and C. Bowles, editors. 2001. Contributors: R. Anderson, D. Archer, U. Bathmann, P Boyd, K. Buesseler, P. Burkill, A. Bychkov, C. Carlson, C. T. A. Chen, S. Doney, H. Ducklow, S. Emerson, R. Feely, G. Feldman, V. Garcon, D. Hansell, R. Hanson, P. Harrison, S. Honjo, C. Jeandel, D. Karl, R. Le Borgne, K. K. Liu, K. Lochte, F. Louanchi, R. Lowry, A. Michaels, P. Monfray, J. Murray, A. Oschlies, T. Platt, J. Priddle, R. Quiñones, D. Ruiz-Pino, T. Saino, E. Sakshaug, G. Shimmield, S. Smith, W. Smith, T. Takahashi, P. Tréguer, D. Wallace, R. Wanninkhof, A. Watson, J. Willebrand, and C. S. Wong. A new vision of ocean biogeochemistry after a decade of the Joint Global Ocean Flux Study (JGOFS). Ambio Special Report 10 (May): 4-31. Frankignoulle, M., and A. V. Borges. 2001. European continental shelf as a significant sink for atmospheric carbon dioxide. GlobalBiogeochemical Cycles 15:569-576. Frankignoulle, M., G. Abril, A. Borges, I. Bourge, C. Canon, B. DeLille, E. Libert, and5J.-M. Théate. 1998. Carbon dioxide emission from European estuaries. Science 282 :434-436. Gattuso, J.-P, M. Frankignoulle, and R. Wollast. 1998. Carbon and carbonate metabolism in coastal aquatic ecosystems. Annual Review of Ecology and Systematics 29:405-434. Hansell, D. A., and C. A. Carlson. 1998. Net community production of dissolved organic carbon. Global Biogeochemical Cycles 12:443-453. Keir, R. S., G. Rehder, and M. Frankignoulle. 2001. Partial pressure and air-sea flux of CO2 in the Northeast Atlantic during September 1995. Deep-Sea Research II 48:317931829. Kempe, S. 1995. Coastal seas: A net source or sink of atmospheric carbon dioxide? LOICZ Reports and Studies No. 1. Texel, the Netherlands: Land Ocean Interaction in the Coastal Zone International Project Office. Kempe, S., and K. Pegler. 1991. Sinks and sources of CO2 in coastal seas: The North Sea. Tellus 43:224-235. Lee, K. 2001. Global net community production estimated from the annual cycle of surface water total dissolved inorganic carbon. Limnology and Oceanography 46:12871297. Liu, K. K., L. Atkinsion, C. T. A. Chen, S. Gao, J. Hall, R. W. MacDonald, L. Talaue McManus, and R. Quinones. 2000. Exploring continental margin carbon fluxes on a global scale. EOS 81:641-642 plus 644. Mackenzie, F. T., L. M. Ver, and A. Lerman. 2000. Coastal-zone biogeochemical dynamics under global warming. International Geology Review 42:193-206. Marty, D., I! Bonin, V. Michotey, and M. Bianchi. 2001. Bacterial biogas production in coastal systems affected by freshwater inputs. Continental Shelf Research 21:2105—2115. Memery, L., M. Levy, S. Verant, and L. Merlivat. 2002. The relevant time scales in estimating the air-sea CO2 exchange in a mid-latitude region. Deep-Sea Research II 49:2067-2092. Milliman, J. D. 1993. Production and accumulation of calcium carbonate in the ocean: Budget of non-steady state. Global Biogeochemical Cycles 7:927-957. Pacyna, J. M., H. Kremer, N. Pirrone, and K. G. Barthel, eds. 2000. Socioeconomic aspects of fluxes of chemicals into the marine environment. European Community Research Project report EUR 19089. Brussels: European Commission. Rabouille, C., F. T. Mackenzie, and L. M. Ver. 2001. Influence of the human perturbation on carbon, nitrogen, and oxygen biogeochemical cycles in the global coastal ocean. Geochimica et Cosmochimica Acta 65:3615-3641. Sharma, S., L. A. Barrie, D. Plummer, J. C. McConnell, P C. Brickell, M. Levasseur, M. Gosseliln, and T. S. Bates. 1999. Flux estimation of oceanic dimethyl sulfide around North America. Journal of Geophysical Research 104 (D17): 21327-21342. Smith, S. V, and J. T. Hollibaugh. 1993. Coastal metabolism and the oceanic carbon balance. Reviews of Geophysics 31:75-89. Smith, S. V, and F. T. Mackenzie. 1987. The ocean as a net heterotrophic system: Implications from the carbon biogeochemical cycle. Global Biogeochemical Cycles 1:187-198. Smith, S. V, W. H. Renwick, R. W. Buddemeier, and C. J. Crossland. 2001. Budgets of soil erosion and deposition for sediments and sedimentary organic carbon across the conterminous United States. Global Biogeochemical Cycles 15:697-707. Takahashi, T., S. C. Sutherland, C. Sweeney, A. Poisson, N. Metzl, B. Tilbrook, N. Bates, R. Wanninkhof, R. A. Feely, C. Sabine, J. Olafsson, and Y. Nojiri. 2002. Global sea-air CO2 flux based on climatological surface ocean pCO2, and seasonal biological and temperature effects. Deep-Sea Research II49:1601-1622. Ver, L. M. B., F. T. Mackenzie, and A. Lerman. 1999a. Carbon cycle in the coastal zone: Effects of global perturbations and change in the past three centuries. Chemical Geology 159:283-304. -. 1999b. Biogeochemical responses of the carbon cycle to natural and human perturbations: Past, present, and future. American Journal of Science 299:762-801. Walsh, J. J. 1995. DOC storage in the Arctic seas: The role of continental shelves. Coastal andEstuarine Studies 49:203-230. Walsh, J. J., and D. A. Dieterle. 1994. 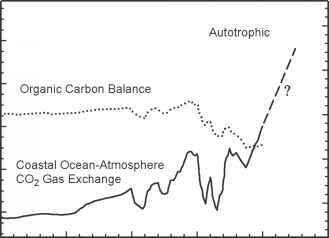 CO2 cycling in the coastal ocean. I. A numerical analysis of the southeastern Bering Sea with applications to the Chuckchi Sea and the northern Gulf of Mexico. Progress in Oceanography 34:335-392. Wollast, R. 1994. The relative importance of biomineralization and dissolution of CaCO3 in the global carbon cycle. Pp. 13-34 in Past and present biomineralization processes: Considerations about the carbonate cycle, edited by F. Doumenge. Bulletin de l'Institut Oceanographique, Monaco, special issue 13. Wollast, R., and L. Chou. 2001. Ocean margin exchange in the northern Gulf of Biscay: OMEX I. An introduction. Deep-Sea Research II48:2971-2978. Yool, A., and M. J. R. Fasham. 2001. An examination of the "continental shelf pump" in an open ocean general circulation model. Global Biogeochemical Cycles 15:831-844.